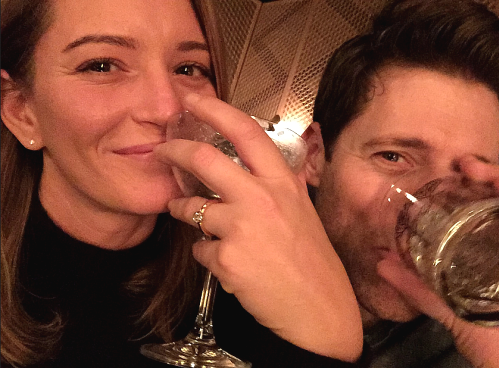 @suziron: @NBCNews Pls get rid of unsheveled, dirty, unprofessional Katy Tur. Biased, not factual, immature. Reporting is awful. Happy birthday, Katy, and congratulations on making it through a year of covering Trump at close range, which would age the avg person 5 years! Trump is taunting Katy in an extended rant from the speaker's platform in FLA, and Thomas Roberts tells her, "Go check Twitter!" He's referring to the popular new hashtag, ImWithTur. MEMBERS OF THE MEDIA defended NBC News reporter Katy Tur on Wednesday after Republican presidential nominee Donald Trump targeted the reporter during a rally. Trump, who often rails against the media during his campaign events, singled out Tur at a rally in Florida as he slammed the media, accusing outlets of dishonesty and bias. "We have massive crowds. There's something happening," Trump told the audience before continuing to chastise the reporter for not talking about the size of his crowds. 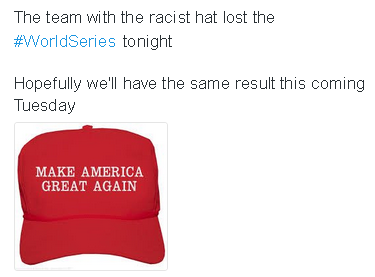 "They're not reporting it. Katy, you're not reporting it, Katy. But there's something happening, Katy. There's something happening, Katy," Trump said. The crowd at the rally booed her as Trump called out the reporter, according to others on scene. As crowd boos media, Trump singles out @KatyTurNBC. "U're not reporting it Katy." Now man in audience yelling angrily: "Report that, Katy!" "Katy, you're not reporting it Katy," Trump chastises @KatyTurNBC for not talking crowd size. 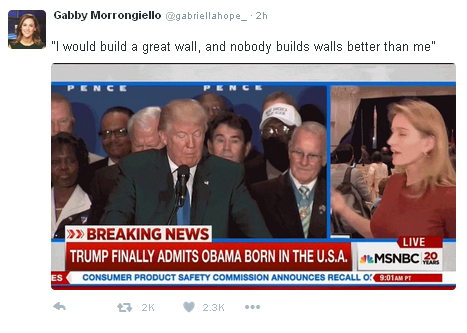 Has done the same with Fox's Carl Cameron. Reporters from a number of news outlets rallied behind the NBC News reporter, commending her reporting. Others criticized Trump. The Washington Post's Chris Cillizza said it was "unacceptable" to call out someone for "simply doing her job" and urged others to follow Tur's reporting. Several reporters tweeted in defense of the NBC News reporter, including the hashtag "#ImWithTur." Trump has singled out Tur at previous campaign events. During a rally in December, Trump pointed to Tur while calling her "little Katy" and a "third-rate reporter," accusing her of falsely reporting he had once left a rally early. In July, Trump also told Tur to "be quiet" during a press conference when she repeatedly sought to ask the candidate a follow-up question. During the press conference, Trump accused the reporter of seeking to help elect Democratic presidential nominee Hillary Clinton to the White House. Katy responds to being called out at the rally by name: "It's just a shtick that he does to energize his base." 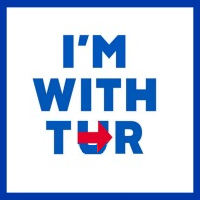 Meanwhile, people in Europe are now tweeting their support; someone said #ImWithTur was trending last night! Katy's got her own hour now -- 2pm Eastern, weekdays! After speech to congress, Katy praises Trump's "presidential" moment ... argues with herself -- and finally arrives at the OPPOSITE conclusion: he wasn't very presidential after all! Christmas in March?-- or showing equidistance between Int'l Women's Day and St. Patrick's? 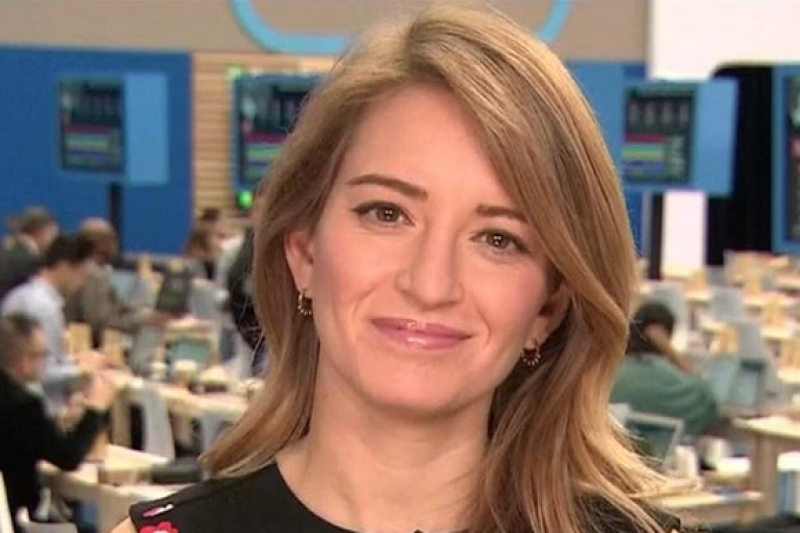 Katy Tur (NBC News), who followed the Trump campaign for 17 months, wins for "courage under pressure," a "complete fluency and mastery" of the subject matter, and an ability to convey it "effortlessly" on live television, whether in the field, at a press conference or in the studio. Providing unique insight into Trump voters, she displayed "grit and perseverance demonstrating the honor of her profession." What did this guy say to Katy anyway? Wow. He's getting an education from witnesses, says he plans to apologize personally to everyone who read it. . . .